What a scrumptious dinner we enjoyed last evening, composed of simply two ingredients. A fresh, not frozen, Game Hen easily serves two and is modestly priced under $5.00. The main requirement to get the most out of the Hen is careful oven roasting, which means overcooking this small bird will dry it out and the tender juicy meat will have been lost . A coating with a savory Marinade will also contribute to the finished flavor. The Delicata Squash rings roasted in the same hot oven made for a delicious accompaniment. 2. Place the flattened Hen, skin side up into a deep sided casserole. 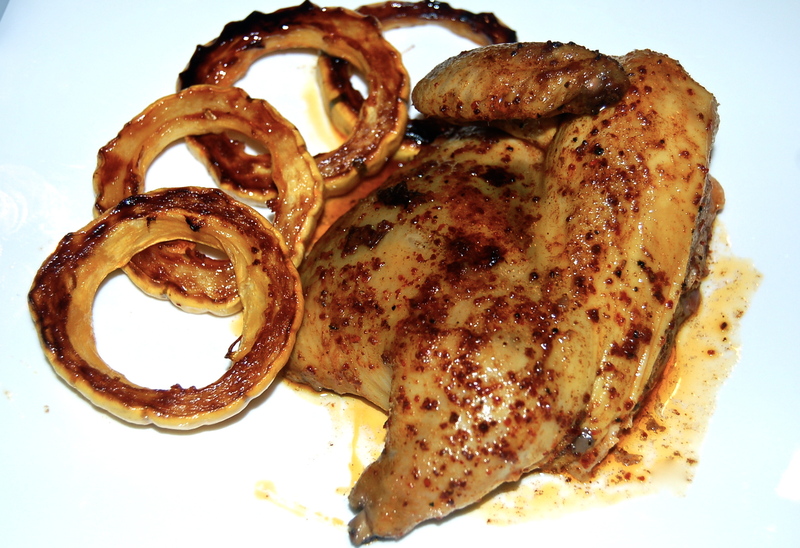 Whisk together the five Marinade ingredients & generously brush it on the Hen. Let it marinate for an hour at room temperature. 3. Place the Hen in the oven for about 20 minutes. Check it with an instant thermometer – the internal temperature inserted in the Breast Meat should be no more than 130 degrees F. Remove to a warm platter, as it rests the temperature will continue to rise. 1. Slice the Squash into 1/2″ rings. Remove the seeds in all the slices. Place the prepared slices into a large bowl. 2. Whisk together the four Marinade ingredients. Pour onto the Squash rings & very carefully coat them. Transfer to a baking sheet in a single layer & oven roast at 400 degrees for about 25 minutes. The should well browned & very tender.